We know that organic sunflower butter is delicious as a spread for breads, crackers, or veggies. Are you ready to use it for baking as something different from almond or peanut butters? Organic sunflower butter is a great ingredient that will add powerful vitamins and minerals to your baking. The small but mighty sunflower seed is a very nutrient-rich addition to any diet. If you use organic sunflower butter in your baking, you will benefit from significantly more zinc, iron, vitamin E, magnesium, and unsaturated fats than you would gain from the same serving of peanut butter. And you don’t have to worry about triggering anyone’s peanut allergy if you’re planning to share your baking! Eating sunflower seeds whole or in organic sunflower butter will promote bone health because of the magnesium and copper, restore skin cells, and help alleviate arthritis pain because of the vitamin E and antioxidants. It will calm and relax because of the high levels of magnesium, and more! Just 100 grams of sunflower seeds provide 40% of your recommended daily intake of protein. Do you like brownies? Have we found a great recipe for brownies with which you can use Naturally Nutty’s organic sunflower butter! What’s really superior about this teen-approved recipe is not only is it delicious and full of the benefits of organic sunflower butter, but it’s gluten-free, too. Check out the recipe for these amazing Sunbutter Brownies we found over at Elana’s Pantry. In search of the perfect organic sunflower butter cookie? The Dinner Mom has a great recipe. These cookies turn out crisp on the outside but chewy and soft on the inside. Not only that, but they are free of peanuts, soy, egg, and dairy. That’s right! These cookies are vegan and devoid of most common allergens. You’ll find Marjory’s recipe for Sunflower Seeds with Chocolate Chips a cinch to make. Short on time or ingredients? Try three ingredient sunflower cookies with our Naturally Nutty organic sunflower butter. Bliss with little effort! We enjoyed reading about Erica’s adventures in perfecting sunflower butter cookies and admired her perfectly balanced cookie and a glass of almond milk. You can find her Three-Ingredient Sunbutter Cookies recipe on her Coffee & Quinoa blog. Did you ever think healthy baking could ever be so yummy and easy? 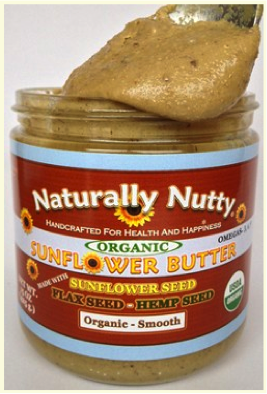 Check out our Naturally Nutty sunflower and other seed butters made in small batches in Northern Michigan. Our delicious high quality organic sunflower butter is prepared using only carefully-selected organic ingredients, and is completely free of GMOs.